Years ago whe n part-time driver Gene Mitchell was the crew chief for Purdue University Bus Department, he coined the saying, Anyone can get a bus anywhere, but no one can buy the kind of service that comes from someone who truly cares. The message continues to inspire the current crew chief, 13-year veteran Steve Moorman who works to ensure quality coach transportation for the University. Purdue is one of only a few universities in the nation that operates its own motorcoach fleet for charter. Transporting more than 100,000 passengers each year, Purdue Transportation affords students and approved university-affiliated groups safe coach travel to destinations that may range from local outings to the agronomy farms up to a weeklong excursion to destinations such as the Deep South. Get more great articles like this one with a subscription to BusRide! The bus department operates solely at the request of the University in its mission, and provides shuttle service to and from basketball and football games. However, it does not solicit tours and excursions independently. Purdue University does not encourage its students to drive to campus, offering a number of alternative transportation solutions instead, including its innovative partnership with the CityBus of Greater Lafayette transit system. Through careful budgeting and management, the bus department has been self-sustaining since its inception, operating on revenue it earns from campus charter services. Over the years the department has seen many changes in demand and the type of travel, with Purdue staying abreast of all the trends. Twenty-five years ago school buses were in demand but more recently interest has swung toward the sleek luxury of motorcoaches. The current fleet consists of nine buses total — four coaches, one mid-size transit and four school buses. The models include a 2002 Neoplan Cityliner, a 1994 and a 2000 MCI 102DL3, a 1988 MCI 96A3 as well as a 2007 MCI J4500. The mid-size is a 2008 Glaval Concorde 2. For school buses the university uses two 1990 Navistar INT 3800s, a 2009 Thomas Transit and a 2010 Thomas Transit with a wheelchair lift. Where demand for coaches exceeds the supply, Moorman turns to several reliable outside independent coach operators to supplement the university fleet. In addition to negotiating mutually acceptable prices, Moorman will frequently check the safety ratings for each vendor company, and speak personally with the assigned driver from that company for each trip. Though Purdue Transportation operations do not fall under Department of Transportation regulations, Moorman says safety is the major priority throughout his department nonetheless. Moorman believes such voluntary compliance helps his department maintain its perfect safety record, clear of any injuries and major accidents. Purdue Transportation requires its drivers to be Heartsaver AED certified to administer automatic electronic defibrillation. Every coach carries an AED unit on every trip. The bus drivers clean and maintain the Purdue buses with the help of two MCI certified mechanics. They say even the oldest 1988 MCI 96A3 motorcoach looks and runs as well as the newest. The department regularly conducts safety inspections performed every 350, 500 and 1,000 hours of service. Purdue currently employs four full-time bus drivers in addition to Moorman as crew chief. Sixteen part-time bus drivers fill in on evenings and weekends. Moorman foresees the need for smaller, comfortably equipped vehicles that can go on longer trips as a trend Purdue is leaning toward. “We want to be ready when the requests start flowing in,” he says. “These vehicles can transport small athletic teams or class trips that may not be large enough to justify the traditional coach.” Moorman also is considering further environmentally friendly options. Football Saturdays are a sea of black and gold in the transportation office, as drivers dress out in team colors to run the football shuttles from the parking lots to Ross Ade Stadium, keeping the team spirit high on the way. Avid season ticket holders such as Mildred Buckles claim the ride in to the stadium is one of the best parts of going to the game. Such a response pleases Moorman. Purdue Transportation director, Carol Cox, says she receives acknowledgement of their outstanding service in letters to her and the drivers from customers expressing their satisfaction. Moorman further notes Purdue alumni are always glad to see the rolling billboards come to their cities and towns. BusRide now available in digital! 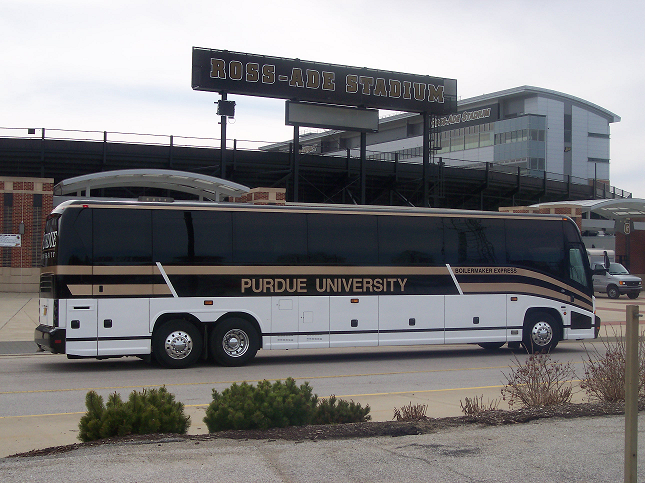 The value of the motorcoaches to Purdue University goes well beyond dollars and cents. The quality of the staff members and the services they deliver are intrinsic and beyond measure. Gray Line Washington D.C. offers a taste of D.C.